COMBINE cornmeal, flour, salt, cayenne pepper and garlic powder. COAT catfish with cornmeal mixture, shaking off excess. Fill a large, heavy skillet half full with vegetable oil. Heat to 350° F.ADD catfish in single layer and fry until golden brown, about 5 to 6 minutes, depending on size. SPREAD butter on each side of rolls, and lightly brown in a large skillet. SMEAR toasted bread with Lemon Aïoli. Layer tomatoes, spinach, bacon and catfish on bread. 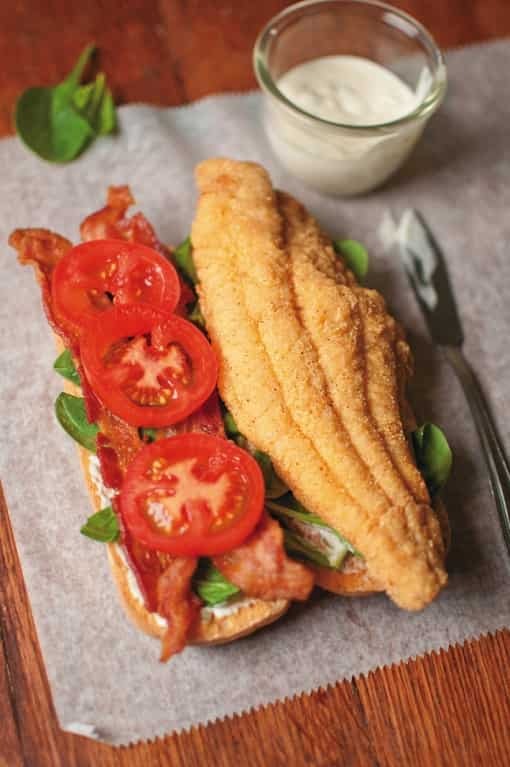 Recipe and photo courtesy of Us Catfish Institute . Used with permission.